A porcelain crown is a kind of dental restoration. They are commonly called “caps” because they fit right over your teeth. A crown is used to cover and protect a tooth that has been damaged or weakened on the surface, but whose root is healthy. Dr. Swearingen will recommend a crown when a filling gets large enough that there is a risk the tooth will break. Because a crown covers the entire tooth surface, the outside of the tooth is shaved down to make room for it without disturbing the adjacent teeth. Then, the crown is placed over it and cemented or bonded into place. There are basically three types of crowns: Gold crowns, porcelain crowns, and porcelain fused to metal crowns. Gold Crowns : Where appearance is not a concern, such as on your back teeth, gold could be the best choice. Gold is very malleable, therefore we can get a more precise fit than with any other type of crown. Gold also eliminates the slight possibility of chipping, giving them very practical longevity. All-Porcelain Crowns : These are the most beautiful type of crowns. Nothing beats porcelain for mimicking the appearance of your own natural teeth. 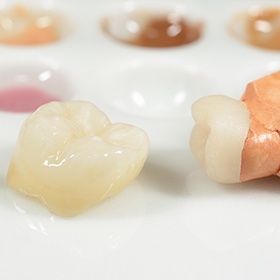 The porcelain is translucent and reflects light much like real tooth enamel does. With a qualified cosmetic dentist to place an all porcelain crown, no one will be able to tell the difference between the crown and your other teeth. While in the past, we couldn't use all-porcelain (or rather all ceramic) crowns on the back teeth, there are some newer ceramics that are made to be strong enough for these purposes. Porcelain Fused to Metal Crowns : These are also made of porcelain, but they have a metal base to give them additional strength, which allows them to work even on the back teeth. Because of the metal substructure, they need an opaque layer under the porcelain to hide the metal. White opaquers are used, which gives them a nearly natural appearance. Having a porcelain crown placed generally requires two appointments. At the first, any decay and old filling materials will be removed. Dr. Swearingen will also refine the shape of your tooth to make room for the crown. Next, an impression of your tooth is made to make sure your crown is a precise fit. While you are waiting for your permanent crown, you will be given a temporary crown to protect the tooth. Once your new crown is ready, it will be permanently placed at the second appointment. If you're in need of a porcelain crown, you may call our office to set an appointment, or you may click here to request one online. Live Closer to Seiling? Visit Our Sister Location.